Yes, November is National Life Writing Month. That gets short shrift compared to NaNoWriMo. During this National Novel Writing Month, so you’ll find writers around the world sequestering themselves or hanging out at libraries or coffee shops, typing away at their novels, trying to make the 50,000 word count by the end of the month. That’s only about 200 draft book-pages, but that’s a good start. Life writers can do their version of NaNoWriMo by focusing hard on writing their nonfiction stories. I find plenty of people who know they have great family stories but are intimidated at the thought of writing them down. They aren’t writers, they don’t know how to start, they feel the project is too big, they don’t have time to figure it all out. 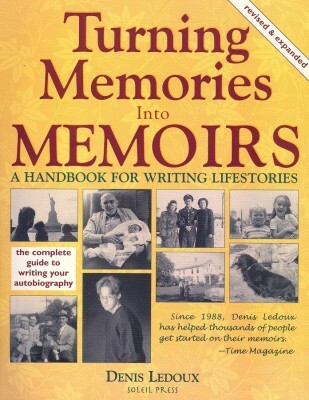 Turning Memories into Memoirs is an overview that encourages those on the edge who feel inadequate in their writing skills. It breaks down the process of life story writing so it is not so overwhelming. Denis’s book is based on his years of leading workshops and will help any new writer gather and organize information and learn how to put it all together. Memoir does not have to be one giant story, but can be a series of short stories—much more manageable. Denis managed to cover all the bases, distilling the whole process down to its bones, leaving room in his short book for plenty of valuable tips, anecdotes, and examples of stories and writing technique. Of course he discusses the standard memoir issues of writing around and about painful memories and of what is the truth, whose truth is it, how much do you put in, and what if you don’t know the truth. He mentions a little about publishing, both for private use and public sales, then ends with a list of resources and an index. I highly recommend Turning Memories into Memoirs to anyone wanting to cut through the fluff and learn more about the actual process of writing and writing well. Denis makes it easy. Brand new writers can feel success just getting their stories down on paper or can be inspired to polish them as brightly as they can with Denis’s explanations. Do you have a family storyteller? What happens to the stories when he or she is gone? Don’t let them disappear! If no one has been telling stories, it’s time to start. Give your family a past to enjoy, let them feel a connection to history and their ancestors. Who are you, and where did you come from? The personalities and life journeys of one generation affect the next. Think about it. The day after Thanksgiving is the National Day of Listening. Especially if you’ve got a family gathering for the holiday, take the time to ask for stories, because if you don’t, you may never hear them. This entry was posted in book reviews, book talk, capturing memories, lifewriting, memoir writing, storytelling, writing, writing skills and tagged book talk, lifewriting, writing. Bookmark the permalink. Linda, thank you for your support of memoir writing and of my book in particular. I appreciate the endorsement. You have made a fine racap of what the reader will find. Thanks so much.